Improves the manufacturing devices from Contraptions Workshop. Now you can choose which armor parts to build, manufacture Vault jumpsuits and energy weapon ammo, and extract components from workshop inventory! Kingsport Lighthouse Little Village Optional, just for fun. Longfellow's Cabin Little Village Optional, just for autobutcher, robot-dismantler, recycler. Manufacturing Extended Addon -- Combo-Butcher Will not work without this. Murkwater construction site Little Village Optional, just for fun. Or additional resources. National Park Visitor's Center Little Village Optional, just for autobutcher, robot-dismantler, recycler. 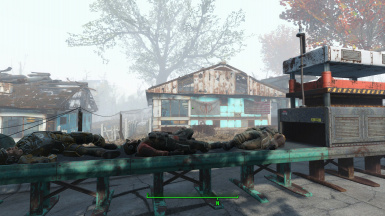 Nuka Red Rocket Little Village Optional, just for fun, where there's the re-spawn area for supermutants\gunners\raiders. If they enter inside the wall-area, they will be killed by a shielded defense, then grinded into materials\flesh\etc. 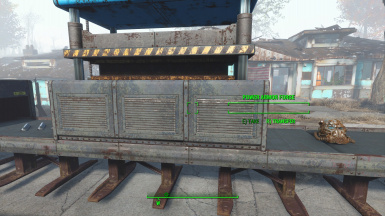 Somerville Place Little Place Optional, just for autobutcher, robot-dismantler, recycler. Starlight Drive In Little Village Optional, but it's funny. And if you use that sick (not you, i mean that perk only) perk of human\ghoul\mutant flash-eater, well, it help a lot. Want to build your own settlers? Workshop Synth Production is just what your factory needs! Version 1.4 allows the component extractor and object extractor to pull items from linked workshops, among other general improvements. You will need to access the extractor's settings from a terminal. Version 1.3 adds a generic object extractor and a workaround for Recycler-related lag. Version 1.2 adds a conveyor intersection, adds an auto-loom to produce faction armor, and allows the explosives mill to produce Nuka Grenades and nuke mines. The manufacturing mechanics introduced in Contraptions Workshop are frankly underwhelming; they require too much manual intervention and tend to be incomplete (ammo types) or annoyingly random (armor manufacturing). This mod aims to fix that. Breaks down junk from the workshop's inventory, then outputs components onto its conveyor belt. 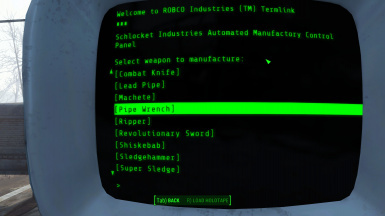 You can specify which components to extract by placing them in its inventory. It can also pull items from workshops linked by supply lines. Pulls items from the workshop. You can specify which items to extract by placing them in its inventory. It can also pull items from workshops linked by supply lines. Junk items passed into it are broken down into components. Deposits items into the workshop's inventory. Allows joining belts at a 90-degree angle. 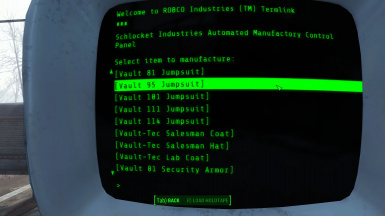 Builds jumpsuits and other Vault-related outfits. Builds Brotherhood, Institute, Railroad, Minutemen, and Atom Cats clothing. 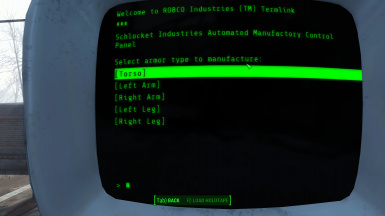 Builds power armor pieces, fusion cores, and frame kits. With a kit in your inventory, go to the Special workshop category to build a frame. Produces alcohol and Nuka Cola products. Breaks down destroyed robots into junk and components. 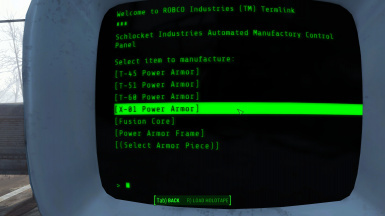 When power to this device is toggled, components, ammo, and aid items stored in the workbench are consolidated into a single object reference. 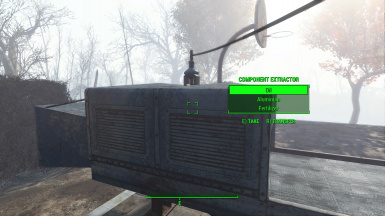 This can relieve lag caused by how FO4 handles in-world objects. Now allows you to choose which piece is produced. 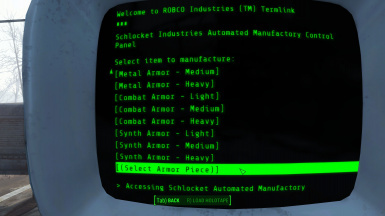 Also can now produce synth armor. 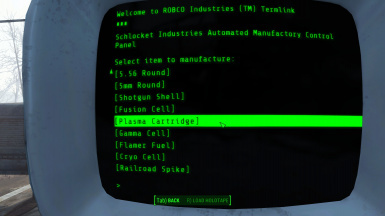 Now produces fusion cells, plasma cartridges, gamma cells, flamer fuel, cryo cells, and railroad spikes. Now produces cannonballs, missiles, mini-nukes, nuka grenades, and nuke mines. Now produces syringers and railway rifles. Now produces Institute laser weapons. 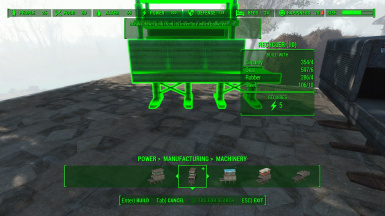 Other modders have taken Manufacturing Extended and... extended it. Please message me if you'd like your mod featured here.